Access to Archive expansion package. It is possible to search mails by specifying a criteria in the fields: Subjects, From (only for incoming messages), To (only for sent messages). It is possible to archive important messages by pressing a button named Archive. When clicked the flag archived will be set. Archived messages will never be deleted from the system. Note: Non archived messages will be kept online for one month, then they will be canceled. A new page archived will show the archived messages. The page is similar to the Received messages page, but will have the option Unarchive instead of Archive. 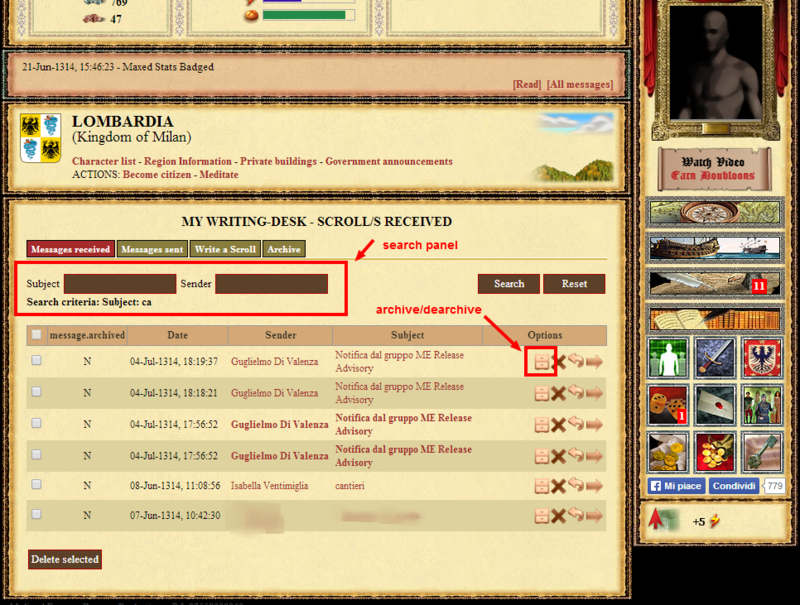 In the archive page a button name Expand the archive will be added. By clicking it a player can add a slot for further 25 emails. It won' t be possible to archive more than 515 messages.